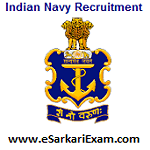 Eligible Candidates can Download Exam Result and Merit List of AA, SSR 08/2018 Batch at the Official Website of Indian Navy. Click on Current Event Link at Home Page. Open Merit List AA 144, SSR 08/2018 Batch Link. Download Merit List by Clicking Appropriate Link. Check Merit By Using Name, Reg No. and DOB.